As you’ve probably heard, living in Norway is expensive. It might be a bit easier right now with the NOK falling, but in any case between the rent, the transportation, the food, the drinks and all the things one needs just to live, things sum up pretty fast if you are not careful with your budget. As an indication, Norwegian students get a mix of a loan and a scholarship called Lånekasse which sums up to 7800 NOK per month, more on the first month. And most either work on the side or get money from their parents as this is rarely enough to live in cities where rents are expensive such as Tromsø or Oslo. Make sure you have enough to live! You can save money by buying seasonal and Norwegian food such as potatoes, cabbage and fish; ride a bicycle that you buy second hand on Finn.no instead of paying for the bus all year around. You can also make your own alcohol to save on bars JUST KIDDING. Doing that is a crime in Norway, and bringing more than your quota of alcohol every time go get in is illegal. Check your quota here. If you decide to go to Sweden on a free bus or go home and bring your local brew back to Norway. This can be rough as cities like Tromsø don’t have enough flats for all of those who need a place to live, and also expensive. All channels need to be explored, from student housing to renting a room with an older person who needs a little help with groceries or fixing in the house in exchange for a room to rent at a lower price. If you haven’t found a place yet check Norwegian websites Finn and Hybel. You might need a Norwegian person to help you with the language on the site, not everything is in English there. For short term Airbnb can also be a temporary (but expensive) solution. Make sure you rent a place that fits in your budget so that you don’t end up with less than 3000 NOK per month to live! Of course it is easier to mingle with other international students as you have the same experience of moving to a new country, and you don’t understand much of what is happening around you. However, there are great benefits to meeting Norwegians: it will make this exchange a cultural experience, and deepen your understanding of this country. You could have met people from your own country if you had stayed at home, so take this opportunity of being in Norway to meet Norwegians, get invited to their hytte, get introduced to Norwegian food and make the most out of your Norwegian experience. Sure, it’s not always easy as they usually have their own group of friends and networks from before, but definitely not impossible. Check here How to make Norwegian friends? 4. Learn about the Norwegian culture and history. You have landed in a very special country, and whether it is by choice or by coincidence, there are many wonderful and interesting things about the Norwegian culture which are worth exploring. Did you know that Norwegians go to their mountain cabins during Easter holidays and eat 35 million eggs? Did you know that Norway has been an independant country since 1905? Did you know that Norway, despite its small population (5 million inhabitants), has two national official languages and many more at a local level including three Sami languages? Did you know that there are more dialects in Norway than inhabitants? (Just kidding on that last one, although sometimes it really feels like it). If you open your eyes and your ears, you will find many interesting things to learn about Norway. Sure, going out in bars can be expensive, but many things in Norway are free and wonderful. If you are here only for a year, travel around by hitchhiking or cheap buses. Camp in the wild (it is allowed to camp in most forests for up to three days for free in Norway). Go and visit the local beauties around your campus and your university’s area. Whether you are in Trondheim, Bergen, Tromsø, Oslo or Longyearbyen, Norway offers magical sceneries and amazing nature. See how on How to travel on a budget in Norway. You might only be here for one year, or even one semester, but learning a new language is always worth it, even though you only learn a few words. Start with “Ha det bra” and “Takk” and take it from there. It will make it easier to make Norwegian friends as you are showing some interest in their language and culture. It will make you understand what is happening around you: in the bus, on the train, at the shop. It will make you feel like you are part of the community, not just in an international bubble living a parallel life to the Norwegian life. Check here on How to pretend to be fluent in Norwegian? and How to become fluent in Norwegian (or die trying)? And the Norwegian weather in general, which is completely unstable and unpredictable. And windy. When I got here several years ago my parents had given me gloves made of cotton which looked very warm to me (for South of France they were at least). Except that in Norway you are probably going to need wool. Now woollen underwear (ullundertøy) can be expensive, so check out Uff and other second hand shops. Basically you need to prepare yourself clothes-wise as well as mentally for the winter. It’s not that bad, if you just make sure you have activities and friends, and that you enjoy the nature. Read more here on How to survive your winter depression. 8. Don’t forget to study for your grades! Last but not least. Although Norway offers wonderful outdoor activities and your university has many social happenings, do not forget to study for your exams. You are here for a cultural experience but also to make sure you go back to your country with grades high enough to continue your studies and show your university and future employers that this exchange was a good investment in you. Sometimes a short exchange becomes a much longer life experience. If you end up staying in Norway after this exchange, either because you have found a job, or found love here, then prepare yourself to integrate in Norway. That is another topic, but for a taste of what is coming your way, read How to be a happy immigrant in Norway? 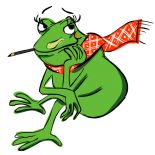 My blog A Frog in the Fjord which does not give much practical information, more like humorous insight into Norwegian culture and lifestyle seen from a foreigner’s perspective (I am French and live in Oslo). Practical information about living in and moving to Norway Life in Norway, written by a British guy living in Trondheim. DNT, the national trekking association of Norway, which has many cabins all over the country. Become a member and travel! Interesting, but it’s in the middle of the Spain -France handball match! “Vivre la République ” Be interested in sport, is a good advice for a foreign student. Don’t you think?? In my student days, I made both beer and wine with a friend in the student dormitory, both from DIY kits that are sold perfectly legally in shops. The beer turned out to be rather a wasted effort, the white wine on the other hand was, even if it did not TASTE particularly good, very potent indeed and allowed us to get drunk as skunks on a number of occasions with a very minimal outlay of money. As students, this was pretty much all we were asking for. I just had a fantastic experience studying Norwegian for six weeks at UiO’s International Summer School. I love Norway, love Oslo, and hope to return for Norsk Trinn 2 next summer! Previous Previous post: Why are there so many male teases in Norway?